Used alongside healthy lifestyle changes, certain beverages are more effective than others at promoting weight loss. Some types of beverages have been shown to boost metabolism, promote fullness and decrease hunger, all of which may encourage weight loss. Here are the best 5 drinks to lose some weight and enhance your diet. Green tea is often associated with health, and for good reason. Not only is it packed with beneficial antioxidants and other powerful nutrients, it’s also one of the most effective drinks for weight loss. Drinking green tea has been shown to decrease body weight and body fat in several studies. Coffee contains caffeine, a substance that acts as a stimulant in the body and may benefit weight loss. Coffee can also reduce energy intake and boost metabolism, which may help you lose weight. One study in 33 overweight adults found that those who drank coffee containing 6 mg of caffeine per kilogram of body weight consumed significantly fewer overall calories than those who drank less caffeine or no caffeine at all. Like green tea, black tea contains compounds that may stimulate weight loss. Black tea is high in polyphenols, including a group of polyphenolic compounds called flavonoids. Polyphenols are powerful antioxidants that may help reduce body weight. A study found that rats fed a high-fat diet supplemented with 5% ginger powder for four weeks had significant reductions in body weight and significant improvements in HDL (“good”) cholesterol levels compared to rats fed a high-fat diet without ginger. Research suggests that having water before meals can set you up for success when trying to cut back on calories and lose weight. It is because drinking water benefits your waistline by keeping you full in between meals and increasing the number of calories you burn. Sitting is the new smoking. Has anyone told you that yet? Research shows how a sedentary lifestyle can knock years off our lives. Now, that’s not something pleasing to know. Hence, With our work and lifestyle promoting sedentary living like never before. Therefore, it’s time for a change – which we have in the form of a standing desk. It’s all the rage right now. But is it worth it? How can it make your life better (and longer)? Standing desks can improve your metabolism and also increase circulation. Reports suggest how sitting for long periods can elevate blood sugar levels and increase body fat around the waist. Thus, in yet another study, the blood sugar spike reduced by 43% in office workers. Hence, who stood for 180 minutes after lunch when compared to sitting for the same duration. Prolonged sitting has shown to cause a host of diseases, cardiovascular disease being the most prevalent of them. More shockingly, you might still be at risk of heart disease. Thus, even if you perform a good amount of physical activity every day. Hence, especially if the remaining time is spent sitting. 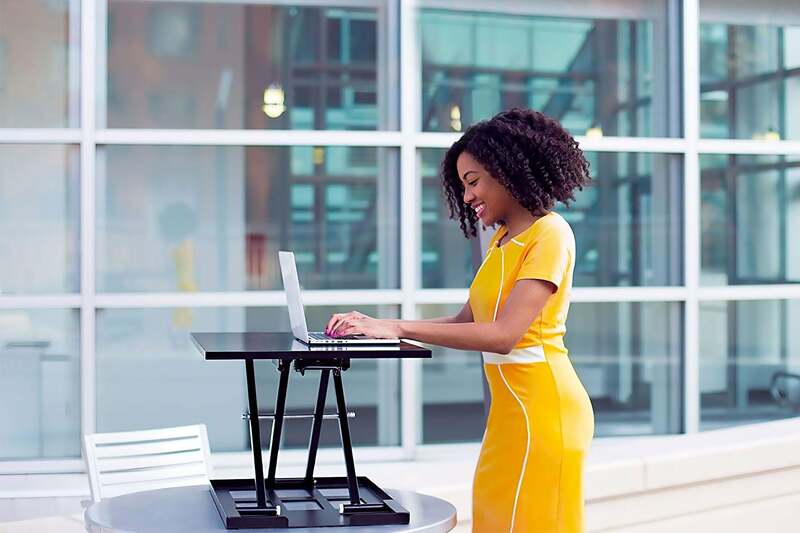 Hence, in another study, short-term use of standing workstations had improved cardiometabolic risk parameters in office individuals. Back pain is one common problem in almost every office with a sedentary lifestyle. But studies have shown how participants saw improvement in their symptoms after using standing desks. Thus, using a standing desk was also found to reduce upper back and neck pain by as much as 54%. The desk, as per the study, can reduce sitting time and generate other benefits in addition to relieving pain. Standing enhances your blood circulation, and this can help stimulate brain activity and improve your mood as a result. When you stand, you are bound to alternate your body weight between your left and right legs. This further improves circulation. Hence, with a better mood, you can also be far more productive. This also means less stress. Cubital tunnel syndrome occurs when the ulnar nerve gets compress and irritate at the elbow. Pain and numbness in the ring finger, little finger, and forearm. Thus, are typical symptoms of this second most common peripheral nerve compression syndrome (1). Conventional treatment methods like painkillers, splinting, and surgery work. But you can boost your recovery by adding exercise therapy. Here are the 3 best, most effective cubital tunnel syndrome exercises to reduce pain and increase mobility faster. 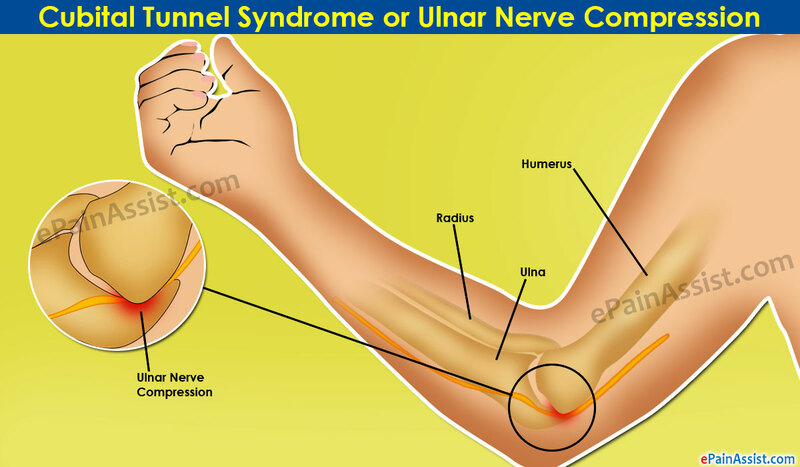 Cubital tunnel syndrome occurs when the ulnar nerve gets compressed or injured. The cubital tunnel is a small, 4 mm tunnel-like opening present in your elbow, between the muscles and bones. The ulnar nerve, which is responsible for movement and feeling in your hands, runs from your neck, shoulder, and arm. Hence, through the cubital tunnel to your ring finger and little finger. Hence, Due to the narrow opening, injury, and repetitive movement of the arm, the ulnar nerve may get injured. This, in turn, causes pain, numbness, and limited range of motion in your arm and fingers.